Introduction to Sharpening Unsharp Mask Part 1 Part 2 Part 3. In the quest for ever more detail in images, camera manufacturers make larger film cameras, like the step up from 35 mm to medium and large format, or the megapixel count of digital cameras. But now with high signal-to-noise images from digital cameras, and fast computers, there is another way to improve spatial resolution. Traditional digital photography image "sharpening" is the "unsharp mask" tool found in many digital image processing programs, such as Photoshop. Unsharp mask has become the tool of choice for many photographers. But, in my experience, unsharp mask only gives the illusion of increased sharpness. The unsharp mask blurs the image, then adds back to the original image a scaled version of the difference between the original and blurred images. This differencing step enhances edges (as well as noise), making contrast at the edge higher. But in an unsharp image, one really wants to move information contained in one pixel where it should not be back to the pixel where it belongs. For example, think of a star as a point source. In a blurry image, the star's light is spread out over several pixels. Unsharp mask will not put all that light into one pixel where it belongs. But other methods, called image deconvolution, or image restoration will do this, at least to a degree. This page explores what can be done with the Adaptive Richardson-Lucy algorithm. This algorithm has been around for over 40 years. See the classic papers by Richardson (1972) and Lucy (1974) (see references). The test image used here is shown in Figure 1. It was obtained with a Canon 1D Mark II 8-megapixel digital camera, at ISO 100, raw plus jpeg modes. The raw image was processed first. Figure 1. 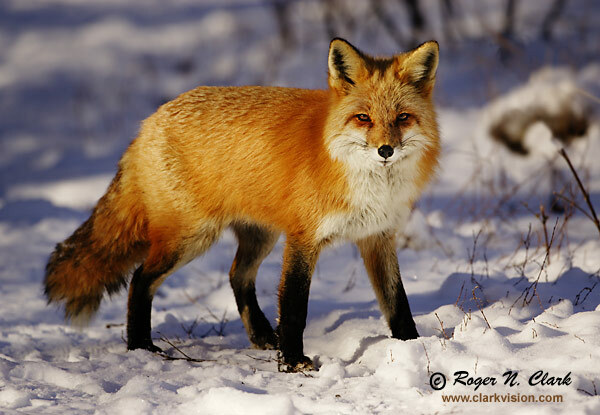 Red Fox, final image after image levels and contrast adjustments, and image restoration. Figure 1 shows the whole image with a minor crop off the left side from the original image. For detailed comparisons, we'll look at the image data at full resolution around the left eye. This is shown in Figure 2. In order to maximize image detail, I experimented with 2x and 4x enlargements using Photoshop's cubic spline image size tool. Since 4x image restoration tests gave essentially the same final detail as 2x enlargements, I present the 2x results here. The cropped test section of the 2x cubic spline enlargement is shown in Figure 3. The original image is 3504 x 2336 pixels. At 300 pixels per inch (ppi), that makes a 11.68 x 7.79 inch print. The 2x enlarged full image has 7008 x 4672 pixels, and at 16-bits/channel is a 192 MByte file, making a 23.36 x 15.57 inch print. But that print would not be real sharp. Figure 2. Red Fox, full resolution image after image levels and contrast adjustments. Figure 3. Red Fox, 2x cubic spline enlarged image. This is the base image for image restoration tests. As a first step, the image was sharpened with Photoshop's unsharp mask tool. Two unsharp mask methods are tried: small radius large effect in Figure 4, and larger radius, small effect two times in Figure 5. The two step method with larger radius produces a better result in my opinion. But it would be nice to be sharper. Figure 4. 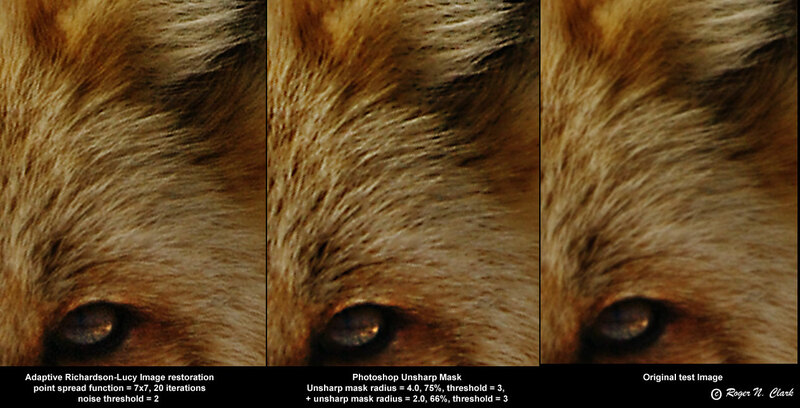 Red Fox, image from Figure 3 after photoshop unsharp mask, radius = 0.6, 300%, threshold = 3. There is little change from the image in Figure 3. Adaptive Richardson-Lucey image restoration was tried using ImagesPlus. Various iterations, point spread sizes, and noise thresholds were tried. The point spread of 7x7, with 20 iterations in Figure 6 produced the best result for this image, considering the entire image. This method also produced few artifacts, fewer than the unsharp mask method, and again considering the whole image. Figure 6. Red Fox, image from Figure 3 after Adaptive Richardson-Lucey image restoration, point spread function = 7x7, noise threshold = 2.0 standard deviations, 20 iterations. The image restoration took about 1.5 hours on the 7008 x 4672 pixel image on a circa 2005 1.8 GHz Pentium 4 computer. It took 32 seconds to do the same thing to the smaller Figure 3 image. On a circa 2012 3-Ghz I7 class machine, it only takes a couple of minutes. The disadvantage of the Adaptive Richardson-Lucey restoration is compute time, and increased noise (but unsharp mask also enhances noise). The signal-to-noise in a smooth area above the fox's head is 64.9 in the original image, 64.8 in the Unsharp Mask image, and 62.0 in the Adaptive Richardson-Lucey image. So, considering the improvement, shown side by side in Figure 7, the small loss in signal-to-noise is worth the improvement in my opinion. The ImagesPlus program can have multiple images open at once and the restoration done on all open images. So one can set up a long run and go to work or bed, or out photographing while the computer works. Finally, one can use more than one method. Figure 8 shows the result from the image restoration in Figure 6 with unsharp masking applied. Figure 7. Image data from Figures 3, 5, and 6 side by side for comparison. Note how the hairs in the Richardson-Lucey deconvolved image are much narrower than those from unsharp mask. Unsharp mask has increased edge contrast but has not improved resolution. Figure 8. 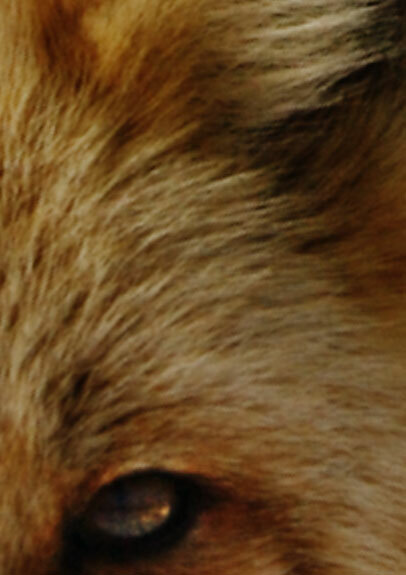 Red Fox, Image from Figure 6 with Unsharp Mask applied with radius = 1.2, level = 100%, threshold = 2. There is no reason one can't apply image restoration and unsharp mask to improve the image. Image restoration (also called image deconvolution) methods, like Adaptive Richardson-Lucey provide a significant improvement in image sharpness over traditional unsharp mask methods. My impression of Photoshop, working in 16-bit mode, results in posterization of the output results from the unsharp mask, while ImagesPlus Adaptive Richardson-Lucey algorithm produces a smoother looking image with more tonal gradations, as well as sharper appearance of edges and detail. I believe I can get 2x larger prints with similar apparent sharpness using Adaptive Richardson-Lucey methods. This makes an 8-megapixel camera more like a 32 megapixel camera. If you would like to try and improve the image better than I have done, here is a link to the original crop 16-bit/channel tif file, 355 KBytes: fox.c01.06.2004.JZ3F3731.frmraw-crop1a.b.tif If you make an improvement, I would like the see your results, and how you achieved it. This is Part 1 of illustrating image sharpening methods. Part 3 is here: http://www.clarkvision.com/articles/image-restoration3/. Film Versus Digital Executive Summary. Lucy, L.B., "An iterative technique for the rectification of observed distributions", Astronomical J., 79, 745, (1974). Richardson, W.H., "Bayesian-Based Iterative Method of Image Restoration", J. Optical Society America, 62, 55, (1972).